We are proud to announce a new partnership with the Thomas Mason textile mill. 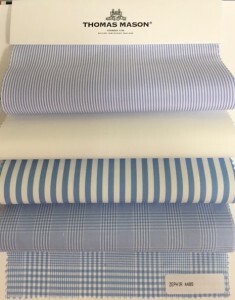 Founded in Leeds England in 1796, Thomas Mason has been creating the world’s finest shirt fabrics for generations. In 1936, the British royal family started wearing Thomas Mason, which became the exclusive fabric supplier to the royal court’s tailors. The firm sources the finest cotton available from their own plantations from the fertile soil of the Nile delta. Today Thomas Mason represents the benchmark for lovers of the British taste.